Bright yellow gold and sparkling green emeralds stand out together in this 14K gold emerald band for women from Apples of Gold Jewelry. The 14K yellow gold band measures 2.6mm at the top of the band and tapers to 1.6mm wide at the bottom. The band is lined with 23 hunter green, authentic gemstones, from the top down both of the sides. The emerald gemstones weigh 0.32 carats total. This beautiful ring is perfect if you are looking into a new wedding band or a fashion piece that will add a little more color to your day. 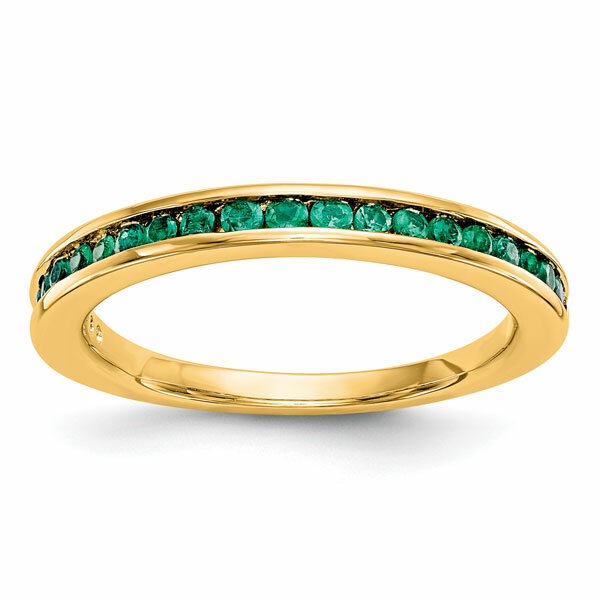 We guarantee our 14K Yellow Gold Emerald Band for Women to be high quality, authentic jewelry, as described above.